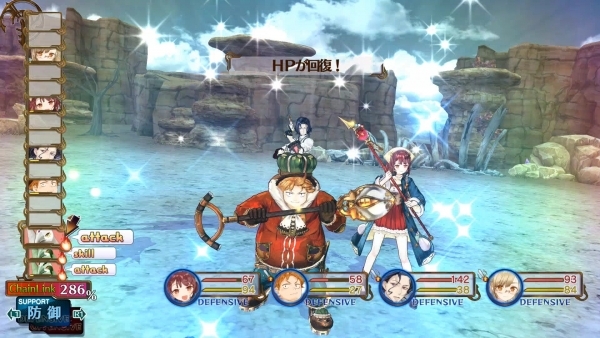 New characters introduced in Dengeki PlayStation. Dengeki PlayStation this week introduces three new characters set to appear in Atelier Sophie: The Alchemist of the Mysterious Book. Meklet (voiced by Sachi Matsumoto) – A young boy who appears before Sophie. He seems to be looking into alchemy, though his intentions are unknown. He has a childlike appearance, but can occasionally see through to the true nature of things. Atomina (voiced by Hina Kino) – A young girl who is always by Meklet’s side. Compared to the lively Meklet, she is more so the silent type. She tends to display the innocence appropriate for her age. Tess Heitzmann (voiced by Sayaka Nakaya) – A bright and simple-minded troublemaker. She’s the show girl working at a cafe to support her large family. There will be “Group Requests” where you’ll be contracted to collect materials and battle monsters in the same area. Rewards for these requests are set higher than normal requests. You can obtain vouchers as rewards. There are also items that can only be obtained through vouchers. While its effect is unknown, something called a “Date Ticket” is in the game. You can learn about new item and monster appearances by listening to rumors at the cafe. You can make Plachta wear only chocolate instead of clothes.